Gordon and Li Li are cousins. Li Li is from Beijing, China, and speaks Mandarin. Gordon lives in Brooklyn, New York, and speaks English. When Li Li visits Gordon for the first time, the cousins must learn to communicate using simple, everyday words. 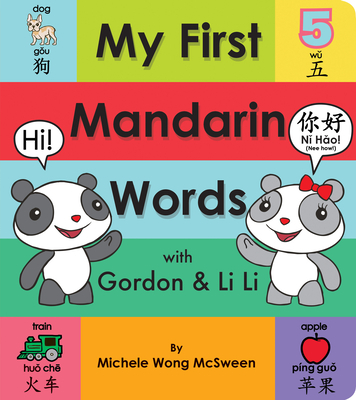 Children and caregivers can read along with Gordon and Li Li as they learn basic English and Mandarin words and their correct pronunciation. Each spread of this sturdy book spotlights a different theme, including greetings, everyday words, numbers, and animals! And every word features the English and Pinyin spelling along with the Chinese character and the phonetic Mandarin pronunciation to help readers practice. Michele Wong McSween is a mom, fashion designer, author, and a fourth-generation Chinese American. McSween holds degrees from University of California at Berkeley and the Fashion Institute of Design and Merchandising. Growing up, she never learned Chinese and wanted to be sure her own boys were confident with Chinese language and culture. She created Gordon & Li Li to help engage kids and parents alike with Mandarin. She resides in Brooklyn, New York, with her husband, three sons, and French bulldog.